The Camposanto is the last of the buildings constructed in Piazza del Duomo, or Pizza dei Miracoli (Miracle Square), and is situated on the northern side. Building works began in 1277. Its interior rectangular layout is formed by four huge arcaded corridors facing onto a central courtyard. 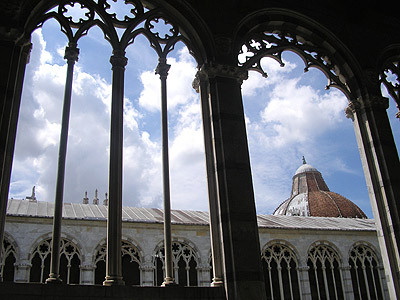 Here, nobles and illustrious people from Pisa were buried. As far back as the 14th Century, some ancient sarcophagi which were placed here were discovered during archaeological digs. Over the years, the corridors of the structure have become a true and proper archaeological museum, thanks also to continuous finds or subsequent acquisitions: the collection which can be seen today is rich in quality and numerous pieces, as well being as fascinating for its unusual arrangement. The bombardments of 27th July 1944 profoundly damaged the structure, causing an irreparable reduction of the marvellous cycles of frescoes which adorned the same corridors. since 1986, this museum has been housed in the Canonical building of the Cathedral, on the eastern side of the Square. The museum collects works which come from the monumental buildings in the same square. There’s a section dedicated to architectonic fragments and sculpture – a section for Giovanni Pisani – one for Tino da Camaino – one for Nino Pisano – a section of treasures and silver – a section dedicated to paintings and sculptures from the 15th Century to the 18th Century – and an archaeological section. is situated at No. 53 Via S. Maria and houses Palaeontological and Paletnologic Sections. the building faces the banks of the River Arno between Piazza Carrara and Via S. Maria. Dating back to 1583, its interior is in preparation as a museum, but is still (as of April 2005) in a further preparative phase. It conserves tapestries, furnishings and armaments beginning from the 16th Century.